As I throw this soup together with ingredients I picked up at my local Mexican food market, it occurs to me how few of you live just a few hours from the US/Mexico boarder. You might not have access to some of the best handmade Mexican sauces and chilies north of Tijuana. You might even only have access to these ingredients via the canned goods section of your grocery store. This makes me appreciate my town so much. It’s a great food city. Of course, lots of famous chefs and food reality show contestants head for the Sunshine State and set up shop, but my favorite food in Los Angeles comes from the hands of immigrants, handed down through the generations, made from scratch just the way it was by their great grandmother in her kitchen on another side of the world. We also have more produce than all the other states combined. California grows more than half the produce in the United States. So many things, like California Strawberries, are in season all year long. That’s amazing. 1. Farmers Markets. This is a must. And no matter what time of year you visit, we’ll have one for you. All year long, any day of the week, you can find one. Everything from produce, to fancy salt, to home grown honey to the goat cheese guy who even brings along his goats. 2. Butchering Classes at Lindy & Grundy. This is the butcher that all of L.A. has a collective girl crush on. Two amazing women started this butcher shop and from time to time offer classes on how to expertly break down meat. Even if you can’t partake in a class, stop by and check out the incredible shop. 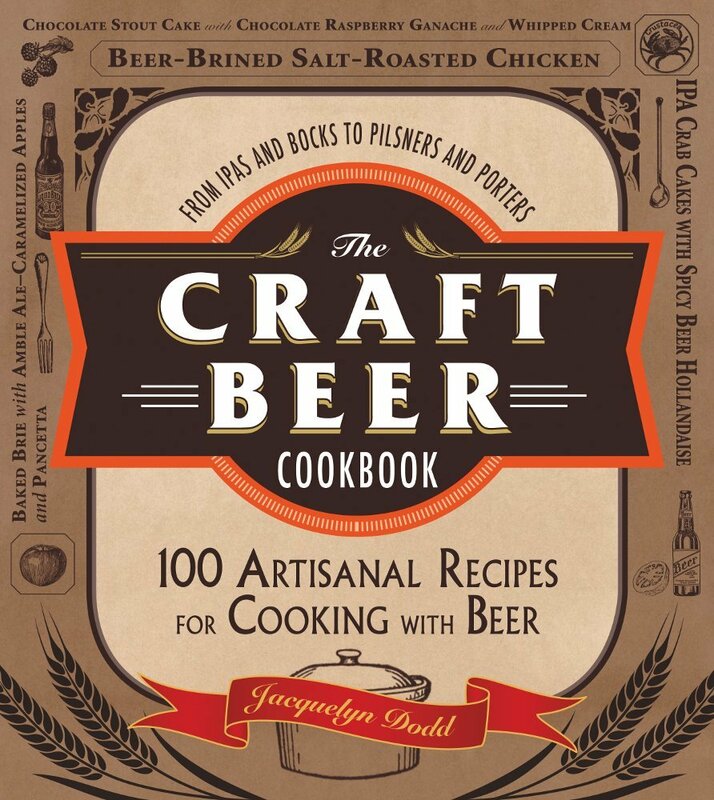 Then go next door to The Fat Dog and have yourself a Croque Madame and a glass of craft beer. 3. Happy Hour At Bar Bouchon. I had an office in Beverly Hills and spent two years immersed in that little town. Although I never really came to love it, I did get to know the 90210 fairly well. My favorite happy hour was at Thomas Keller’s Bar Bouchon. You can sit on a little patio that opens to the Beverly Canon Gardens, opposite Scott Conants Scarpetta at the Montage. While we are on that subject, I have been fortunate enough to have been invited to a seven course tasting dinner at the Chefs table in the kitchen of the Scarpetta, twice, and it was incredible. Although I didn’t have to pick up the tab either time, that may have colored my opinion, but if you can swing it, the pasta is even better than you would expect from the Modern Master of Italian Cuisine. Given the vast price difference, I would have to give my final Beverly Hills recommendation to Bar Bouchons Happy Hour, if you are in town Monday though Thursday from 4-7pm. Bar Bouchon is great for people watching, the food is fabulous AND well priced. There are very few places in Beverly Hills that you can get such great food will out feeling like your bank account has been pillaged. 4. Surfas and Helms Bakery. These two food and baking Meccas of Los Angeles are located conviently close to each other and offer everything from professional grade products, to classes to one of the best hamburgers in all of Los Angeles. Food events, food shopping, food markets, restaurants, bars all make this little area a must for the food travelers. Check both websites for events and classes, Surfas often has free cooking demos that don’t make the website. You can call ahead to check. 5. Fast Food Worth the Hype and the Sodium: In-N-Out, especially if you haven’t had it, it’s a must. Check out the Secret Menu to order like a pro, although most of us just order the Double Double Animal Style. Roscoe’s Chicken and Waffles, and you have to eat the chicken and the waffles together, none of that side by side nonsense. Pink’s Hot Dogs, it’s an institution. In a land where even historic landmarks are torn down for ultra-modern mini lofts, Pinks has managed to keep it’s foot hold on the corner of Melrose and La Brea for 73 years. You would be hard pressed to find a Los Angeles resident, famous or commoner, who hasn’t eaten there. But beware, even at midnight on a Tuesday, there will be a line. Randy’s Doughnuts. Before Sprinkles, before Krispy Kreme, before the Macaron Madness, there was Randy and his little hand held treats inside a tiny shop with a gigantic doughnut shaped sign on the roof. It’s conveniently close to LAX, and worth a cab ride if you find yourself at the airport with nothing to do for a few hours. 6. Downtown After Dark. Unlike most cities, the Downtown we have in Los Angeles is a bit skeevy and unused. By day it’s mostly a financial district peppered with the house-challenged, and little to do. But in recent years the night life has taken off. Right now, it’s my favorite place for a night out. Coles is one of my favorite places to stop for a drink, along with it’s back bar, Varnish. It’s the oldest bar in Los Angeles, over 100 years old and even served as a speakeasy during prohibition. Although it had a slight remodel, it’s decor is authentic and true to it’s roots. The food is….OK, but the bartenders are complete pros. If you are looking for an expertly crafted cocktail and possibly the definitive Old Fashion, this is a place to go. These are people who know their stuff and are in love with art of the cocktail, don’t even think about ordering a Scooby Snack or a Jager Bomb, show some respect for the cocktail. Library Bar is almost always busy but the vibe is great, and the Pork Belly Skewers are the best pig bites in all of L.A. Make reservations at Baco Mercat and go with someone who wants to share food, family style. The Edison is worth the trip just to see the amazing space. Housed in a 100 year old building that once served as powder plant, and now has a Golden Age feel, and even a beautiful, but very tame, burlesque shows on the weekend. 7. Festivals and Food Events. These happen nearly every weekend. Read up before you come, LA Times Food, LA Magazine, Experience LA, Grub Street and even Yelp Events Page are good places to start. So there you are. My Cliffs notes on my little town. There is so much here that I love, even my small local markets that I wish I could take you too. If you do visit, think like a local, try your best to stay off the tourist-beaten path, that is where the best stuff happens. In a large pot, add the broth and the enchilada sauce. Bring to a simmer. Add the chicken and poach until cooked though. Remove the chicken from the pot, shred chicken using two forks. Add Masa Harina, cumin and the pepper to the broth, whisk until well combined. Add the chicken back into the pot with the chilies, olives, and beans. Allow to simmer until slightly thickened, about 15 minutes. Add tomatoes, and then add the hot sauce to taste. Pour into bowls, garnish with cheddar, cilantro and avocado. (Note: Try to buy as few of these ingredients in cans as possible. Look for jars or even cartons, if you can. Too many ingredients from a can will give you an overwhelming metallic taste. This soup was inspired by Ali’s Carnitas Soup. 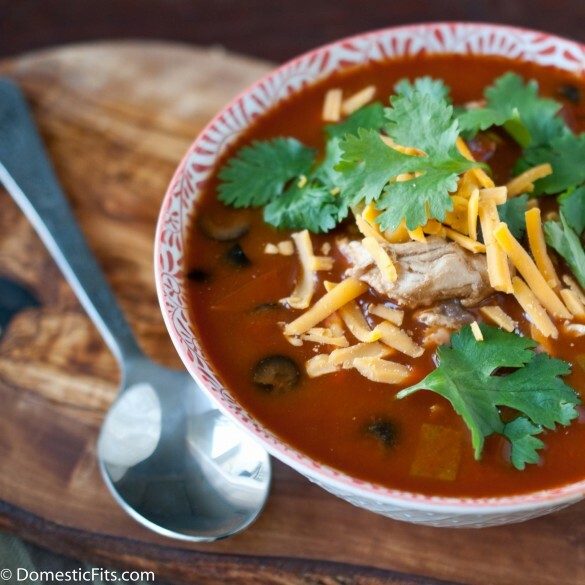 22 Responses to Chicken Enchilada Soup & Foodies Things To Do in L.A.
You’ve seriously combined all of my favorite ingredients into one hearty, comforting soup! And thanks for the list of fun things to do in LA! I hope we can do a couple of these things together in the coming weeks, starting with the farmer’s market! You should check out Surfas for sure! Next time you are on the West Side, the classes are great, and most are free. I can’t wait to visit you and explore your city together! This sounds sounds incredible. I would looooove that! You would have so much fun here, so much great food. What a great roundup of awesome places. I should head North more often but Long Beach and the South bay has some good places too. I do need a recommendation for a small cool playhouse in L.A. as part of a Christmas pressie, any ideas? I love Pinks and had them come and cater my wife’s 40th, it was really cool! so how about i not print off that list of things to do and you TAKE me to do all those things next time i’m in LA – it’s bound to happen, I have cousins there so you know I’ll be there eventually 🙂 oh and then we can make this gorgeous looking soup together! Yes, it’s amazing. They also have another restaurant called Son of a Gun that I might like even more. Great places to go if you are in L.A.
Oh my god this soup is exactly what I need in my life right now – stupid sore throat! Also, I’m so grateful for this list! I’m thinking about driving back from the potluck in April and spending a week in LA; This list will be put to work! You should do that, April is a great time in L.A. The weather is awesome and there aren’t too many tourist yet, things get crazy crowded in the summer. This looks super easy to make vegetarian, so I think I’m going to have to do it. Because there are olives! In this soup! Make it with mushrooms! You should visit. Northern and Southern California are so different, they really could be two separate states. I love them both, but they are so different. I love Napa, I hope to make it back up there again next year. I am saving this post for out next trip to LA! 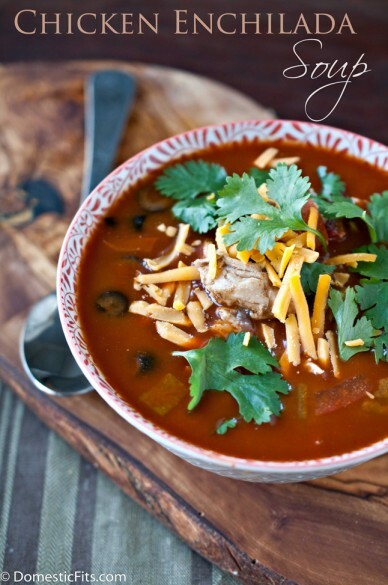 And this soup would be perfect for today – one of the coldest days we had so far! I can give you so many more recommendations if you need them, there is so much to do here! I have got to come to LA! I’m pretty sure I could eat this for lunch every day for a week and be perfectly happy. YUM! 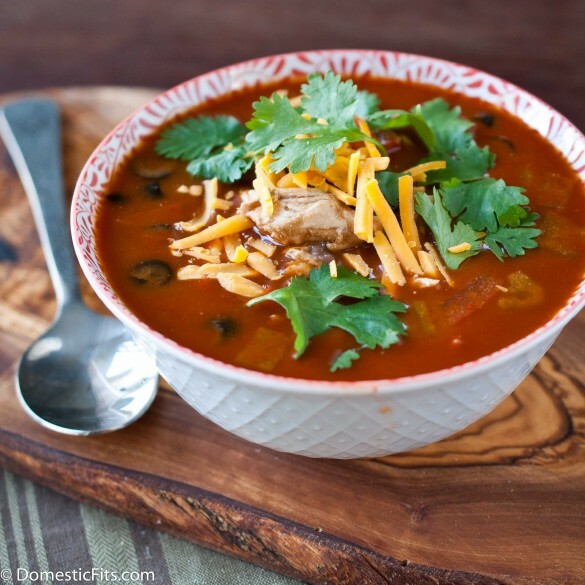 That chicken enchilada soup looks so thick and rich! I’d love to have a spoonful right now! Thanks for this list, Jackie! Will save it for a potential visit to LA some day… And how delicious does this soup look and sound!